The kidneys remove wastes from the blood and are the effectors for controlling the water potential of the blood. The removal of waste products generated by metabolic reactions inside body cells is called Excretion. Some of these products are toxic, while others are simply in excess of requirements. CO2 produced by aerobic respiration. CO2 dissolves in H2O to produce a weak acid, so if too much builds up in body fluids the pH drops, which can damage cells and disrupt metabolism. CO2 is transported to the lungs dissolved in blood plasma and excreted in expired air. Nitrogenous excretory products, in particular urea. Excess amino acids cannot be stored in the body. In the liver, they are converted to urea, CO(NH2)2, and a keto acid. The keto acid can be respired to provide energy, or converted to fat for storage. The urea dissolves in the blood plasma and is removed and excreted by the kidneys. 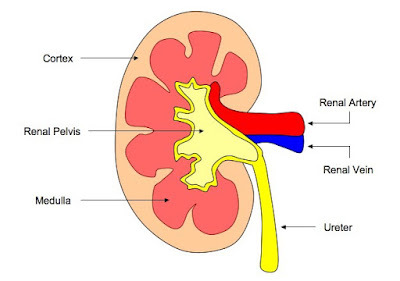 Each kidney is supplied with oxygenated blood through a renal artery. Blood is removed in the renal vein. A tube called the ureter takes urine from the kidney to the bladder. Each kidney contains thousands of microscopic tubes called nephrons. The beginning of each nephron is a cup-shaped structure called a renal capsule (Bowman's capsule). This is in the cortex of the kidney. 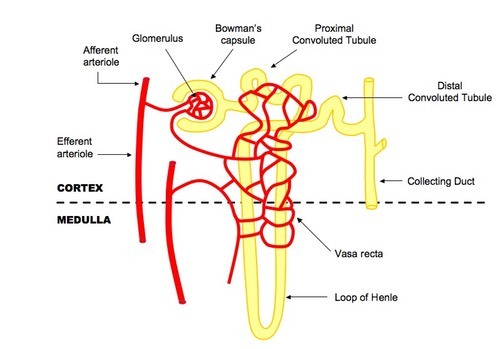 The tube leads from the renal capsule down into the kidney medulla, then loops back into the cortex before finally running back down through the medulla into the pelvis of the kidney, where it joins the ureter. 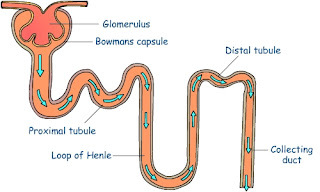 Each nephron has a network of blood vessels assodated with it. 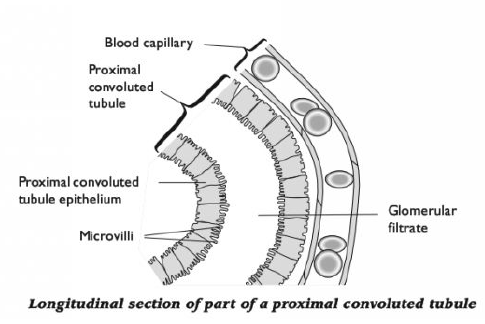 Blood arrives in the afferent arteriole (from the renal artery), and is delivered to a network of capillaries, called a glomerulus, in the cup of the renal capsule. Blood leaves the glomerulus in the efferent arteriole, which is narrower than the afferent arteriole. This leads to another network of capillaries that wraps around the nephron, before delivering the blood to a branch of the renal vein. 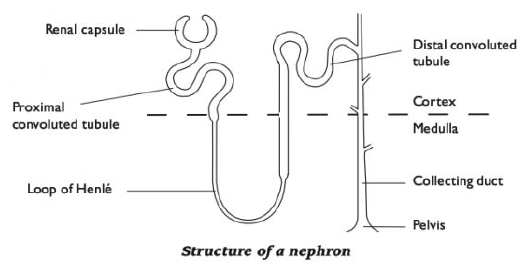 The diagrams below show the histology (structure of tissues) of the kidney.